Retired owner of P.C. 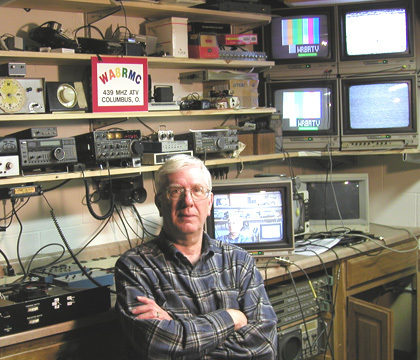 Electronics, The Leader in Amateur Television Equipment for 50 years - history. See my W6ORG Surplus web page. I'm happy to answer any ATV questions from licensed Radio Amateurs so please always include your call letters in the email. Licensed Amateur Radio operators can transmit live action color video and sound to other hams easily on the 420 MHz and up Amateur bands. Check out all the fun applications and technical info on our web site. Start simple, build your ATV operation and one day it may look like WA8RMC's ham shack. 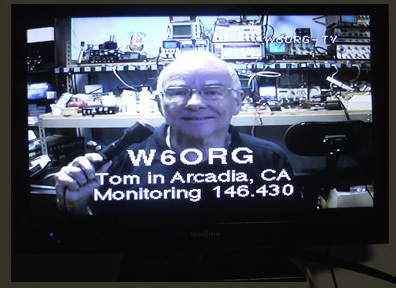 NEW - Listen to the Everything Hamradio Podcast interview with Tom W6ORG on the subject of ATV. Receive directly on cable channels 57 thru 60. 5 element beam. Great for home or portable. 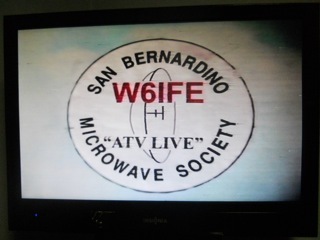 434 MHz, receive on cable channel 59. 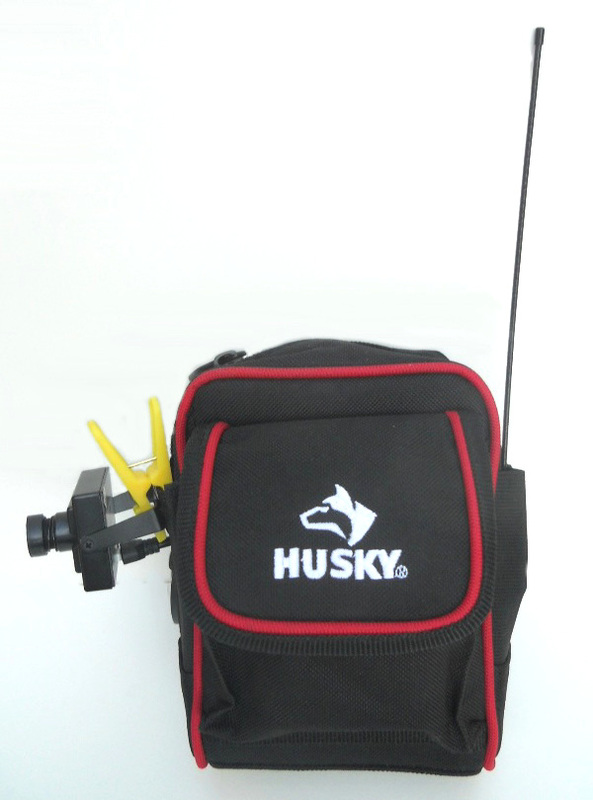 Great for ATV demos, hat cam, robot, R/C video. 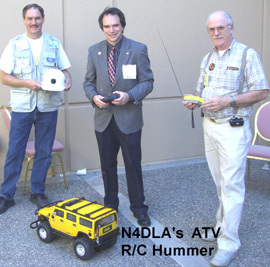 The least cost way to just try out Amateur Television - ATV - with a neighborhood ham, ham club demo, public service events and R/C transmitting live action color video a half mile or more line of sight, is to buy a Videolynx 434 50 mW transmitter module for $99 and connect it to your camcorder or any camera with a video output, 9V alkaline battery and 70cm antenna - receive it with the TV set to cable channel 59. If you want sound and able to select any of the 4 standard 70cm ATV frequencies, then the Videolynx Z70A at $149 is for you. 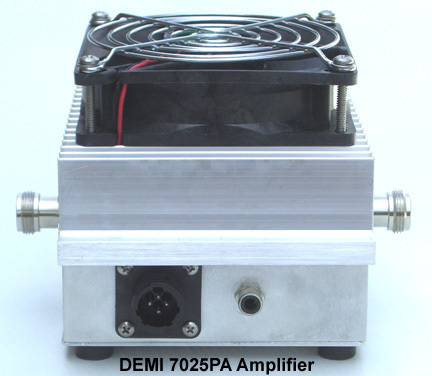 For higher power and greater DX add a linear amp - see the transmitting section below. Put the 434 or Z70A transmitter in a belt pouch along with the camera and batteries to send video back to a mobile command post, aid station, etc., at public service events. 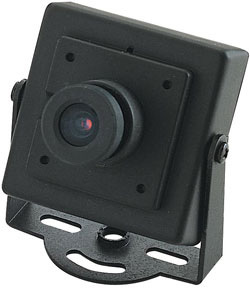 Let others see what you see by making a hat cam with the 434 or Z70A transmitter module and a mini color camera. See pages 9-11 to 9-13 in the ARRL Operating Manual 10th edition. Also see the ARRL Handbook for Radio Communications Image Communications chapter. Put a 434 transmitter in an R/C car, aircraft, boat or robot to get a remote view and better control. 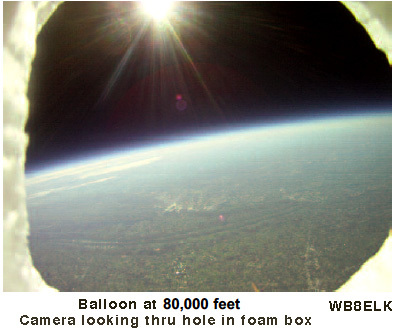 See the earth live from 80,000 ft like this view with a VM-70X transmitter module in a high altitude balloon. live or from a recording simplex or to a local repeater for those who couldn't make it with the TX70-5s transmitter. The 434 or Z70A modules are great for demonstrating ATV at a ham club. 5 element, end mounted, 31" boom and 50 Ohms. Great for home or portable. Have a local ATVer transmit a picture to you while you talk back on two meters - usually 144.34 or 146.43 simplex. You will hear them on the sound subcarrier coming out of your TV speaker. Connect your TV to an outside 70cm antenna with the same polarity as used by your areas ATVers. It does not get any cheaper than this to check out the ATV action. The 75/50 Ohm miss match is negligible and you can use a F to N connector adaptor. Set your digital or old analog TV tuner to cable channel 57, 58, 59 or 60 depending on what frequency is used in your area - cable channels are on different frequencies than the old analog over the air broadcast channels. Cable channel 60 is in the 70cm ham band at 439.25 MHz, over the air broadcast UHF TV channel 60 is 747.25 MHz, and each channel is spaced by 6 MHz. The TV tuner should lock on, even if off a MHz - the off the TV screen photo at right is actually transmitted 3/4 MHz higher than cable channel 59. Antennas are the key, so good coax and mounted as high as possible to get line of sight will work best. 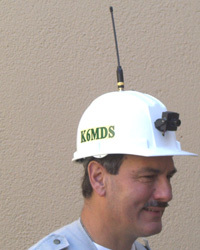 You can build an antenna or buy one like in the antenna section below. It is best to select a TV that does not go to blue screen or automatic shut off when there is a snowy picture or no signal present. You dont want the TV to shut off while monitoring a local ATV repeater, searching for DX or aligning your beam. Some TV's require reprogramming the active channel memory so that you can use cable channels 57-60 or channel 3 or 8 if using a downconverter for the 900 or 1200 MHz bands. The easiest is to connect the TV to your Cable TV service, then push the channel program button in the CATV mode. This should set the TV up to select most all channels even when no signal is present when no ham is on the air at that instant. 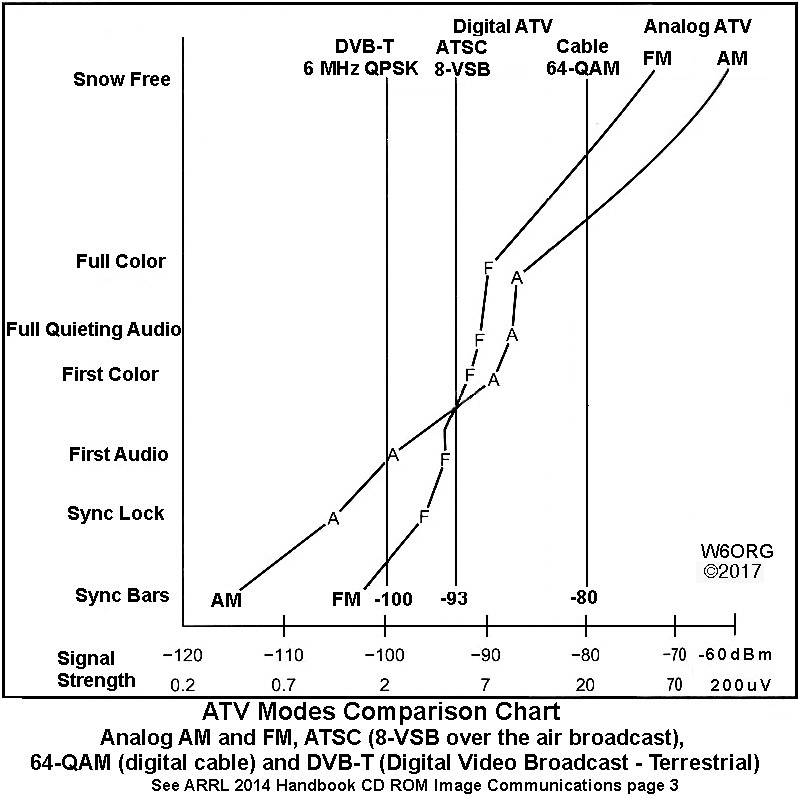 New TV's will contain an analog NTSC cable channel tuner in addition to digital channels per FCC Rule 15.118(b) to accomodate all cable TV systems, but it is a good idea to keep your old analog only TV's for ATV work rather than trash them when you buy a new digital TV. A net can greatly benefit getting ATVers by video to show and tell rather than trying to describe something by voice only - "Pictures are worth a thousand words." With ATV you can have full duplex audio - while one transmits and talks on the ATV sound subcarrier, everyone else can watch and listen on their cable ready TV set (cable ch 58, 59, 60) or TV with our downconverter, and at the same time talk back on a two meter FM voice frequency (better interaction and eliminates the long winded). How about setting ATV up at your ham club and transmitting the meeting live or by tape later to those members who cannot attend. The possibilities are endless - see our ATV application notes web pages. Want to check out ATV in your area but don't have a cable ready TV (cable ch 57-60), or see a local repeater output that is on the 900 or 1200 MHz band? Then you need to add a downconverter between your antenna and TV that will convert the higher ham bands down to a TV channel. What goes in at the ham band is mixed down to come out on the TV channel. 70cm and higher band Analog ATV will be around for a long time due to the high cost and complexity of transmitting Digital ATV and the fact that new TV's must also have analog cable tuners in them per FCC Rule 15.118(b). However, a downconverter will work for both analog or digital ATV - which ever mode goes in, comes out at the downconverted channel. Current manufactured US TV's have tuners that will work with cable channel analog or digital QAM, as well as over the air broadcast ATSB 8-VSB. We no longer manufacture ATV downconverters, but you may be able to find some of our prior model TVC series downdownconverters on eBay and QRZ.com On Line Swapmeet. Any Technician class licensed Radio Amateur can transmit live action black and white or color video along with audio in the 70cm and above bands to other hams simplex or through ATV repeaters. The 70cm band is the most popular for ATV since any standard TV can be used to receive directly on cable channels 57-60, simple analog transmitters are least cost, and the lower the frequency, the farther the DX with all else equal. Very few multimode UHF transmitters and transceivers support the broad band ATV mode. Most all ATVers use transmitters specifically made for video. Sending analog video is easy by plugging in your camcorder, video camera, digital camera, VCR, or any device with Video outputs that can output on an A/V cable and be normally seen in a video mointor, VCR or TV sets A/V inputs. Most camera mic's are amplified and output line audio which can be plugged into the ATV transmitters line audio input. FM ATV occupies 3 times the bandwidth of analog and can be found in the 33cm bands and above in areas where the particular bands are less used by other modes - consult your local band plan. FM has a 12dB advantage to the snow free signal level vs. analog, but requires a separate FM receiver. Analog AM weak signals can be seen better. Digital ATV is being experimented with and is quite complex. 6 MHz QPSK DVB-T has emerged as the prefered DATV mode. US TV's do not receive DVB-T but this mode is used in Europe and much of the rest of the world. Some inexpensive set top boxes found on the internet will receive DVB-T but may not tune the ham band without a downconverter. However, prices are coming down with the DATV-Express exciter board available for use with computers and the Hi-Des HV-100EH modulator and HV-110 receiver made for the ham market. With DTV, the picture is either P5 or not there - Cliff Effect. The cliff effect receive level is shown on the graph above right. DVB-T 6 MHz QPSK has the best cliff effect signal sensitivity and seems to be the most practical for DX and general ham use. Other bandwidths and digital modulation modes would fall inbetween -100 dBm and -80 dBm. See KH6HTV's appnotes and products for DVB-T. Nano Stations are being used with IP cameras direct and on Ham Mesh networks - see AREDN. The few seconds delay or latency with these digital systems to do their encoding and decoding do take some getting used to when talking back on two meters or crossband duplex. See our Video Latency Test web page. TX70-5s >4W, 4 standard channel 70cm ATV Transmitter. 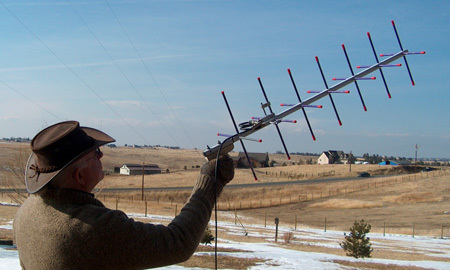 4 Watts can get you over 15 miles snow free line of sight using small OAL 5L-70cm beams at each end. Check on eBay and QRZ.com On Line Swapmeet for our transmitters. Build your own transmitter using the Videolynx VM-70X module and TR-1b relay board. Download and see our application note which contains a parts list and sources, Hammond 1590D die cast aluminum chassis drill template, wiring schematic and more information. Basically you will be drilling the enclosure, mounting the modules, connectors, switches, etd., and doing the interconnect wiring. The FMA5 board is no longer available to add hand mic audio, but line audio from a camcorder or camera can be plugged in for sound. 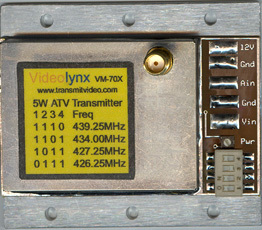 The Videolynx 70cm ATV transmitter modules can be ordered directly from them: the 50mW 434, 50mW 4 ch w/audio Z70A for hat cams, R/C, and demo applications for up to a half mile line of sight, and the 0-5W VM-70X as shown in the photo on the left for home stations, portable at public service events, balloons and rockets. You can even operate the VM-70X as it comes out of the box at 1/2 Watt out by soldering RCA jack to pig tail A/V cables and 11 to 13.8 Vdc power wires to the solder pads. The RF out SMA jack goes to the antenna - we have SMA to N jack adaptor. Download our VM-70X Quick Start page. If you want to adjust up the power, the module will need to be connected to a heat sink or fan as shown in this application note download. More Power - If you start out with the 50-100 mW 434 or Z70A transmitter module, for higher power you can add a Downeast Microwave 7025PA linear amplifier for over 20W, or build your own using one of our PA5 boards and a RA30H4047M module from RF Parts. The TX70-5s/VM-70X can be adjusted down to drive the Mirage amplfiers - D26N, D1010 or D100 ATV versions - to over 50 Watts within their linear range. Downeast Microwave linear amplifiers can also be added to our TX33-.1s 33cm and TX23-.1s 23cm band transmitters. Over the years we have gone back and forth between having available a transceiver or a transmitter that would pair up with a downconverter. The demand has always been about 50-50. So now, since 2008 new TV's have analog cable tuners built in, we went back to stand alone transmitters. Also, you may not need a transceiver, downconverter or TV to use at the transmit location at a public service event. Some areas may only operate through a crossband repeater and very little simplex. Separate units also offer a lower entry cost to 70cm ATV since a cable ready TV can be used to receive on the 70cm ham band. You might still be able to obtain one of our TC series 1, 10 or 20 Watt Transceivers on eBay, QRZ.com On Line Swapmeet or other used ham gear internet web sites. If you do, and it does not come with a manual, email us requesting one giving model number and any revision letter or date etched on the exciter board inside - always include your call letters when emailing us. If you need trouble shooting advice, contact us with your questions. Any of the older transmitters or transceivers may be repaired by us - assuming we have the parts - for $80 plus parts cost. See our repair policy. DX running 4 Watts with a TX70-5s transmitter, 100 ft Belden 9913 or Times LMR400 coax can be snow free up to 60 miles if line of sight using the Directive Systems DSEFO-25ATV antennas at both ends. They are one of the best designed high gain and broadband beams for ATV. With this antenna, 4 Watts is plenty for most all line of sight applications. The hard part, however, is getting line of sight between the two antennas given the curvature of the earth, trees, buildings, etc. Non-line of sight cannot easily be predicted, but how strong a signal is on 2 meter simplex is a good indication that you might have a path - See ATV DX and ATV DX Records. For temperature inversion tropo skip usually in early summer, you can often get over the horizon snow free DX of 60 miles and even further with an added amp, or some snow in the video decreasing one P unit for each doubling of distance. For portable Emcomm, public service work or if antenna size is limited for what ever reason, we also have the The Olde Antenna Lab 5 element 5L-70cm beam as shown at right that gives 8 dBd on a 31 inch boom. The 10 element 10L-70cm gives 11 dBd on a 62 inch boom. Either beam will give you more than 20 miles even running 4 Watts with the TX70-5s or Videolynx VM-70X transmitter module snow free line of sight ATV which is great for portable or just hitting the local ATV repeater. Also see Homebrew Antennas. Note that even with home made ground planes at each end running 4 Watts the snow free DX is over 2 miles. Low loss coax cable and properly made connectors are also important. It does not make sense to invest in a high power transmitter and/or high gain antenna, only to lose a lot of power heating up lossy coax. For runs over 20ft, we suggest the 4/10 inch diameter coax - ie: Times LMR-400, Andrews CNT-400 - or larger with N plugs. N plugs have a gasget that will keep water from getting inside the shield and ruining the coax. If you dont want to put on your own plugs, places like RF Parts, Cable X-Perts, and others can supply various lengths with connectors ready to go. Good antennas up high as possible and line of sight are the most important part of any ATV system for best DX. Directive Systems DSEFO-25ATV 16 dBd gain broadband Yagi antenna on a 17 foot boom. Designed for the serious ATV DXer...$235. The Olde Antenna Lab 5 element 5L-70cm - 8 dBd on a 31 inch boom. End mounted horizontal or vertical...$85. OAL 7CP-70cm, 7 element circular polarized beam can be hand held for manually tracking balloons, rockets, R/C aircraft, ham satellites, or mounted to a mast...$160. 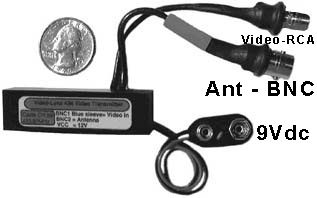 If you have a camcorder (digital or analog) with an A/V cable, you can plug it into the ATV transmitter to send the video and sound. Video out is usually a yellow RCA phono plug which goes into the transmitter video jack. Your camcorder may have two audio plugs if stereo - connect the red right audio out plug into the transmitter line audio jack. However, it may be preferable to use a video camera which will run continuously and dedicate it to the station if your camcorder has a battery saver which shuts it off if not recording after 5-10 minutes. We suggest ATV Research as a good source for a wide variety of video cameras that are available to licensed radio amateurs at wholesale prices. 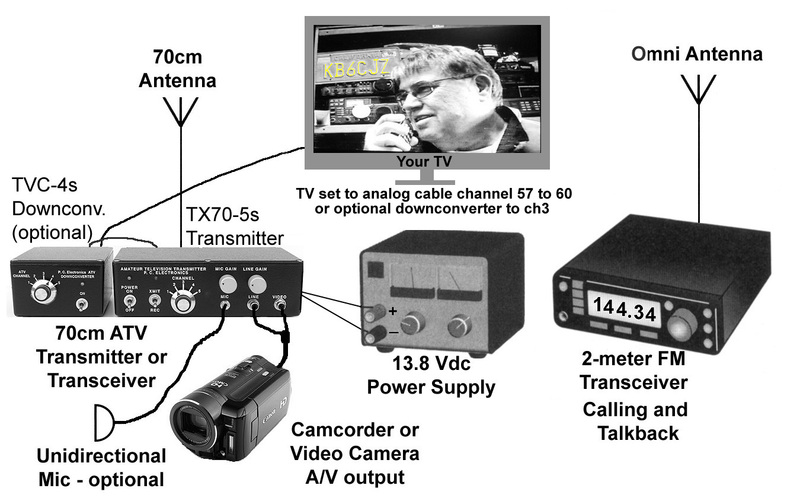 Any FCC Licensed Technician Class or higher Amateur Radio operator can transmit live action color video and sound to other hams that looks and sounds just like analog cable TV with our time proven equipment. You don't need a computer or any interface box like SSTV or Digital TV; This is live full motion color video like you are used to with analog cable TV. Dont trash your old analog tuner only TV's - use them to receive ATV directly. New cable ready digital TV's are required by FCC Rule 15.118(b) to have analog NTSC cable channel tuners in them also. So analog ATV will be around for a long time. If you are in the USA and not a licensed Radio Amateur, see What Is Ham Radio and Getting a Ham License on our Application Notes page and join the fun. We sold our products only to licensed Radio Amateurs verified in the Callbook or FCC data base, and for legal applications in the USA. Outside the USA, the country laws and licensing may be different. Twice the pages including digital ATV and many fun applications starting on page 32.9. Also see the ATV section in the ARRL Operating Manual 9th and 10th editions. Email us - - with your call letters if you have any questions not covered in this web site.